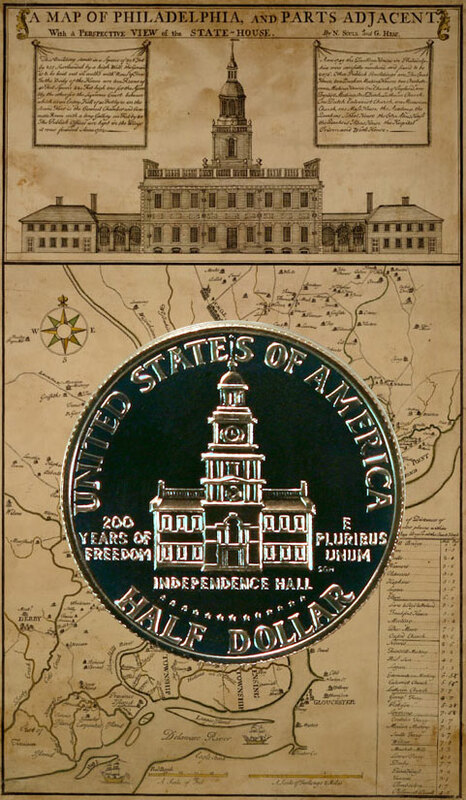 Today, the Bicentennial Half Dollar Coin tells part of the story of the early days of Philadelphia. Though the Swedes arrived in the area earlier in the 1600s, William Penn organized the town of Philadelphia. In late August, 1682, William Penn along with 100 settlers sailed from England on the Welcome, a ship of 300 tons with her Captain Robert Greenaway. The ship carrying William Penn made good time, but several of the passengers succumbed to small-pox on the two-month journey. As the ship traveled the open sea, William Penn turned 38 on his birthday on October 14. In late October, the Welcome entered the Delaware River on her way to her destination. On October 27, 1682, William Penn aboard the Welcome arrived at Philadelphia. 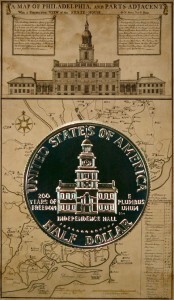 The Bicentennial Half Dollar Coin shows against an early map of Philadelphia including a view of Independence Hall.